Spring has some of the best produce. Not only is it abundant in asparagus, fresh greens, and tomatoes, but rhubarb is hot off the shelves and ready to go. Yes, that’s right, rhubarb people! Most people associate rhubarb with quintessential rhubarb crumble, but there’s so much more to this stalky veggie than meets the eye… er… taste buds. While we’ll never turn down a good crumble, we love putting modern twists on classic produce. Rhubarb doesn’t have to be restricted to a 1950’s British dessert: we’re talking about a strawberry rhubarb chia pudding. This dish covers all the bases. Strawberries add a fresh sweetness that blend perfectly with tangy rhubarb. Combined with creamy coconut milk, textured chia seeds, and a touch of honey (or maple syrup if you’re vegan), this mixture is the perfect combo of sweet, tangy, and velvety goodness. Drooling yet? Enjoy this for breakfast, a snack, or dessert, and serve with slivered almonds or shredded coconut on top. This recipe serves 2. Whisk chia seeds, coconut milk, 1 tsp sweetener, and vanilla extract in a bowl. Set aside and let thicken. In a medium saucepan, add rhubarb, strawberries, sweetener, and vanilla and place on low – medium heat. Stir well and cook for about 10-15 minutes until boiled down. 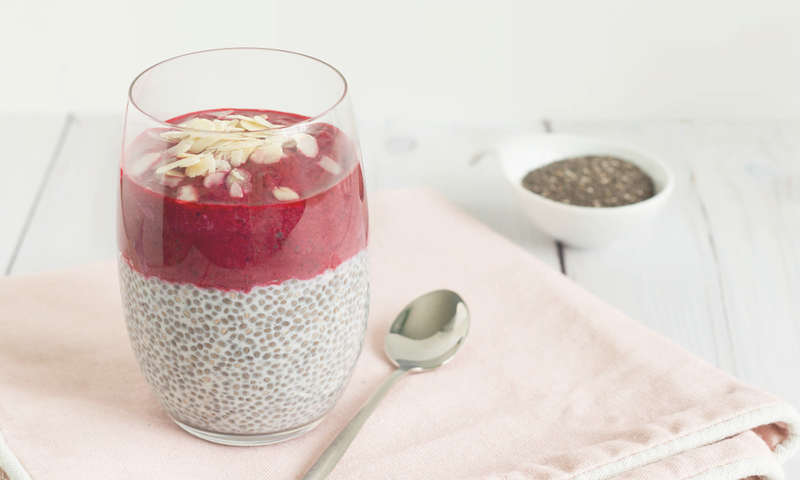 Once cooled, scoop some of the chia pudding into a separate cup. Top with the strawberry rhubarb compote. Lastly, if you like, sprinkle with slivered almonds or coconut flakes. September 9, 2016 - Summer has turned to Fall! September harvests include McIntosh, Shamrock and Honeycrisp apples, O'Henry peaches and plenty of root vegetables. previous post: Enter Our #MyBlushBag Contest To Win A Blush Lane Gift Card!